Get set up for success in the fibre arts! Learn to knit, spin, felt and play with humour and ease in workshops designed to build your skills. Workshops in-house or at yours, in small-group workshops, semi-private or one-on-one. 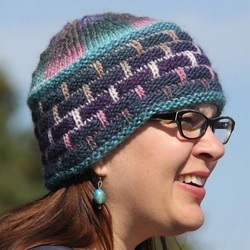 Kathleen, known as "birchblanket" on Ravelry, has been teaching knitting in Alberta for several years. She lovingly supports Local Yarn Stores (in which are found the best fun, advice and baked goods - as well as nummy pretty yarns and fibre)... and thinks you should, too. Shop local. Support each other. Practice abundance - what we give, we receive multiplied in return. Be nice to ourselves. Knitworthiness is okay. Breathe. An avid student of all the fibre arts (and more than a bit of a stash magpie), she is constantly learning and sharing what she's learned with students. Her happiest times are when she finds the joy of the "a-ha!" moment in herself (from whom she learns even more than she teaches). In countless classes, she's learned that students seem very successful with two-hour workshops based around a fun project, learning skills that transfer to larger, other projects. As a result, she's been designing projects and specialized two-hour workshops specifically for the learning of techniques in a low-stress, fun way, so students can be set up for success on their next projects. Join Kathleen in a workshop, or a one-on-one lesson...you'll be glad you did.